It’s a tough battle. 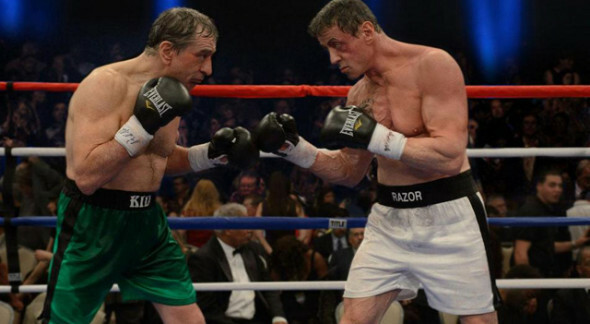 The late-life Sylvester Stallone and Robert De Niro battle hard. They sweat! They flail! They struggle against the stiff competition – I mean, do you remember RIPD? What about After Earth or Grown Ups 2? But, at long last, De Niro and Stallone walk out of that ring triumphant, in that they succeeded in crafting the worst film of 2013. Good on ya, guys! De Niro has been whoring out – I mean, lampooning – his own image for decades, but it’s a row Stallone only accidentally began hoeing recently with his inadvertently comical The Expendables. Here, the two articulate the real tragedy of their waning professional years by reminding us all just how fine Raging Bull and Rocky really are. In case you missed its countless ads, Grudge Match casts De Niro and Stallone as aging boxers lured into a rematch by Kevin Hart, who is actually funny. He’s not funny here, but there’s only so much a person can do. Alan Arkin also tries really hard to salvage his scenes with his talent and solid comic timing. Unfortunately, he shares these scenes with Stallone, who is to comedy what Fox News is to journalism. The nine of us who saw Stop or My Mom will Shoot can attest to this – those of us unscarred enough by the experience to speak of it. De Niro makes you weep for the glory of Raging Bull and the tragedy of lost artistic integrity. Meanwhile Stallone – whose artistic integrity was always pretty suspect – punch-jogs around urban Pennsylvania, trains with a curmudgeonly old man, drinks raw eggs. You see where this is going. It ain’t good. But how can he go wrong with this script? Two old guys fighting! They don’t know what YouTube is – isn’t that hilarious? They probably have rotary phones and listen to 8 tracks, too. Comedy gold. If 90 minutes of ridiculing our elderly isn’t entertainment enough for you, you will need to look elsewhere. In fact, the only reason you should be looking here is if you really hate Robert De Niro and/or Sylvester Stallone and ache to see them embarrass themselves for a paycheck, playing two men willing to embarrass themselves for a paycheck. So, I suppose you really could call Grudge Match the case of life imitating art, which is absolutely the only way the word “art” makes it into a description of this movie.